Making it through your day -- much less working on any resolution to improve your life -- is more difficult when you are deprived of sound sleep. 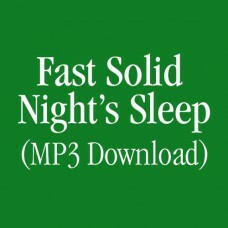 In this 30 minute audio program, I will guide you in thoroughly relaxing your mind and body so that you drift off to deep, peaceful, and restorative zzzzzzz...... 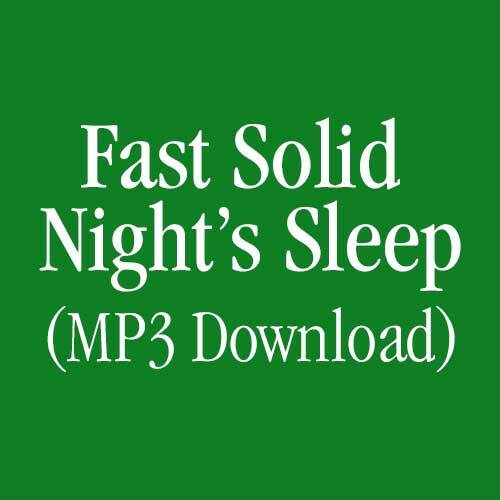 The lush music will put you in just the right state of mind to go to sleep fast with suggestions to stay that way until it's time to awake -- feeling good no matter how little or a lot of time you've spent sleeping. If you are pregnant, have had or are prone to seizures, wear a pacemaker, are epileptic or photosensitive (knowingly or not), you should NOT listen to these programs. The delta wave binaural beats in the music may adversely affect you. Written and Recorded by Alanna Jackson, CH. Edited by Jean Hobgood, CH. Produced by Karen Commins. Music by Christopher Lloyd Clarke. Licensed by RoyaltyFreeMeditationMusic.com. We all need a little help some times. All of the audio products on this page are meant to enhance your own abilities to achieve your resolution. You can use them as a companion to your individualized hypnosis therapy sessions or on their own. In either case, you are the one doing the mental work needed to move forward and enjoy a happier, more fulfilled life. Just as a doctor can't promise a cure, I cannot promise that you will change after listening to and applying the suggestions contained in these programs. I can promise you will have a safe and relaxing journey through the pathways of your mind. This is good because when you make these changes that you desire, you did the work and can be very proud of yourself. It’s not a magic solution, although for some it will feel that way. These products are meant to be listened to over and over. Your subconscious loves Repetition!! You will want to listen to the program daily for 3 weeks to a month in order to gain its full benefit. Then you may want to continue longer with another one because each audio is designed with relaxation for the body in mind. When the relaxation response happens in the body for as little as 15 minutes a day, it switches healthy genes to turn on in the body (Relaxation Revolution, Benson & Proctor, 2010.). Before you begin listening, find a safe place that you can close your eyes and be undisturbed for about 30 minutes. In each program, I first will guide you in relaxing your body and letting go of the cares and stresses of the day. The tranquil and calming music may cause you to float in and out, that's okay. If you hear my voice at the end then your subconscious was listening. If you think you’ve fallen completely asleep, listen while sitting up in a comfortable safe spot. If you are pregnant, have had or are prone to seizures, wear a pacemaker, are epileptic or photosensitive (knowingly or not), you should NOT listen to these programs. The binaural beats in the music may adversely affect you. DO NOT LISTEN TO ANY BINAURAL BEATS OR ANY MUSIC / DOWNLOADS FROM THIS SITE WHILE DRIVING OR OPERATING MACHINERY. Although the binaural beats/music/downloads on this site contribute to wellness, they are not intended as a replacement for medical or psychological treatment. No medical claims are intended express or implied. Despite the fact that all statement made on this website are supported by research, no statements have been evaluated or approved by the U.S. Food and Drug Administration or any other international governance responsible for health care.